What makes it different from other home warranties? Most home warranties offer 12 months of coverage. So does the Simple Warranty. But you can get 6 additional months free because you had your home inspected by Hargrove Inspections, giving you an 18 Month Home Warranty! 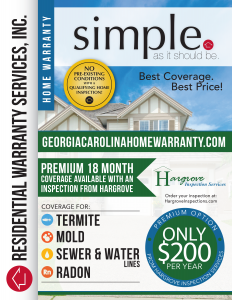 (If you did not get your home inspected by us, you can still purchase the Simple 12 Month Warranty). Represents the broadest coverage on the market today – covers components that most warranties exclude (drain line stoppage, garage door springs, washers, dryers, well pumps, water softeners, HVAC, electrical, plumbing, kitchen appliances and alarm systems). If you are ever denied coverage for a claim that can be verified eligible by any other warranty contract, the claim will be covered, or 100% of your premiums will be refunded. Choose your own contractors for repairs (most warranties make you use their contractors). Simple pricing by square footage of the house. Free listing coverage if you are the seller of the home (during the listing period). The buyer still receives the full 18 months of coverage (other warranty companies charge for this). No “pre-existing condition” excuses to avoid coverage if Hargrove Inspections inspects the property and finds the item in question to be in working order at that time. The Simple Home Warranty is backed by a national warranty company and is available in all 50 states. Remember, having the home inspected by us gives you an additional 6 months free, giving you a full 18 months of home warranty coverage!